Let’s cut to the chase. 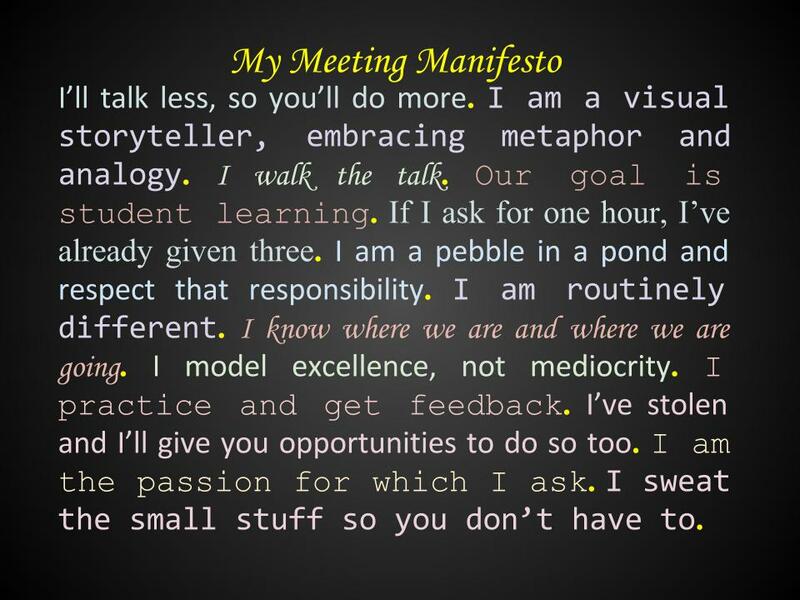 Hands up who unequivocally loves meetings. Just me? Hmmm… So, I think I’ll share some ideas for planning and delivering the dreaded ‘meeting’, a crucial collaborative space. 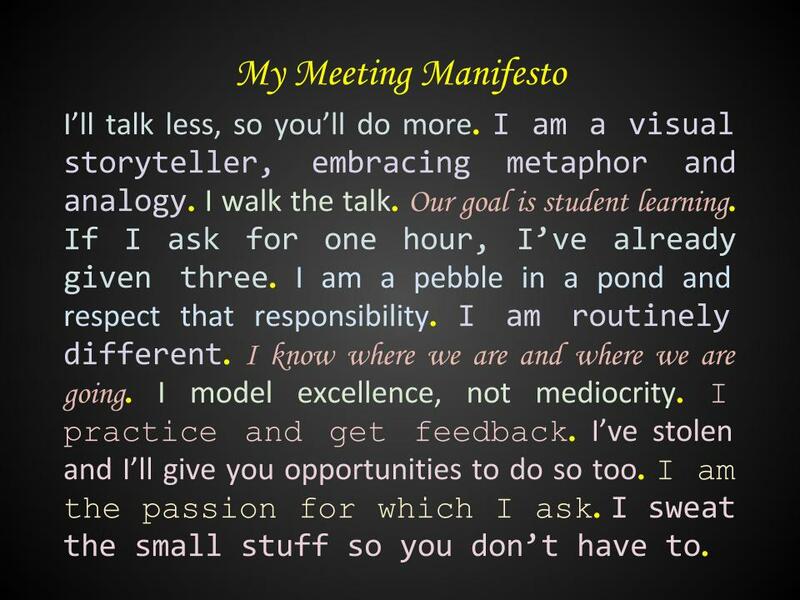 To be clear, when I say meeting, I mean any gathering of teachers, from regular team meetings, to presentations to staff, to professional development workshops. Know Thy goal: Easy. The goal of every gathering should be, at its core, to positively impact student learning. That’s it – the most sacred aspect of any meeting. And if it isn’t, re-think. Walk the Talk: I came across the term ‘double-track’ curriculum at the Principals’ Training Center (PTC), and have embraced it ever since. During a meeting, if you are not modelling the types of things you think make up excellent classroom practice, then, at best, you are sending mixed messages, at worst, you are modelling mediocrity. A simple fix – give your audience something great to steal. Essential Questions: What do the people at your meeting already know? What do you want people to learn more about? What are the most engaging ways to close that gap? How will you accommodate the individual differences in terms of readiness, interests and learning profile? If you haven’t thought about most of those questions carefully, then you’ve missed a trick. The Golden Rule: A variation on the maxim, ‘Do as you would be done by’. Ask yourself, ‘If I was observing this in a classroom, what might I say?’ Long lectures? Not OK. Clumsy visuals? Not OK. Off-topic interruptions? Not OK. The 3:1 Ratio: Don’t underestimate your singular power to positively influence student learning via the ripple effect that might start in your meeting. Respect this knowledge and your participants’ time. Follow the 3:1 rule – three hours of preparation for each hour of meeting. Visual Storytelling: Slides are not scripts. Limit the number of words per slide, relying instead on visual metaphor and analogy. Talk to your audience, don’t read to them. Talk Less, Do More: Tell your story in no more than ten to fifteen minutes. Then, do something. There should be more creation than consumption.